Legalizing rhino horn won't save the rhino. The world's rhinos are facing a poaching crisis. In 2014, poachers killed more than 1,200 rhinos in South Africa. This compares to just 13 in 2007. At this rate of killing, rhinos could be extinct across Africa in a couple of decades. Rhino horn consists of pretty much the same stuff as fingernails. Yet some people believe myths that consuming ground rhino horn can benefit their health. Consequently, rhino horns are sold illegally for a huge amount of money in the likes of Vietnam and China. And where there is money to be made, criminal gangs will step in to supply the demand. Enforcement authorities in South Africa and other rhino range states are struggling to cope. 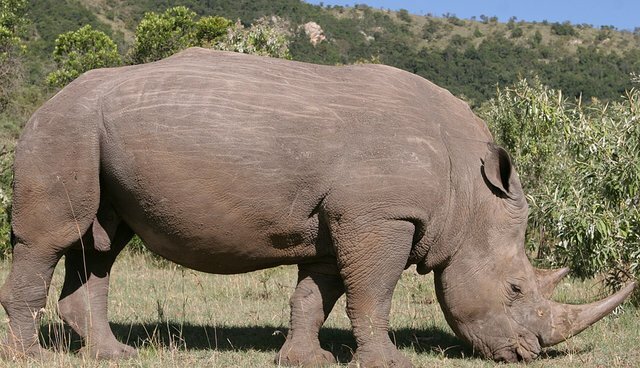 In response, South Africa is considering the possibility of establishing a legal trade mechanism for rhino horn from stockpiles derived from natural mortalities or possibly even from horn "harvested" from live rhinos (unlike elephant ivory, rhino horn grows back if it's carefully removed). A Committee of Inquiry has been established in South Africa to consider the arguments for and against such a move. The Committee will report back to Government later this year. Proponents claim that legalizing international trade in rhino horn will enable the South African authorities, and those they would be trading with, to control the supply and price, and make poaching unprofitable. They also claim the income generated will provide much needed resources for rhino protection and conservation. But when you start to dig into the likely impacts of legalizing trade, it fast becomes apparent that the proposed solution is seriously flawed and the risks involved are enormous. Rhino horn is in demand in Asia as a component of traditional medicine for a variety of old and novel medicinal uses, but also, increasingly, for recreational purposes, as a high-level gift and as an investment. Demand is poorly understood, and the nature of demand is changing rapidly. Surveys suggest that many potential consumers who do not currently purchase rhino horn would consider doing so if it were legally available. Legitimizing the product could bring swathes of new consumers into the marketplace, in Vietnam and other Asian countries. The inevitable shortfall in legal horn would undoubtedly be supplied by the poachers and illegal traders. There are also serious questions about the ability of South Africa and its potential trading partners (presumably China and or Vietnam) to effectively regulate a legal trade. Corruption and laundering are huge challenges for wildlife trade enforcement in these and many other countries. Lessons should be learned from the ivory trade. CITES sanctioned the sale of 110 tons of ivory from stockpiles in South Africa, Botswana, Namibia and Zimbabwe to China and Japan in 2008. However, far from protecting elephants, this sale has been followed by massive increases in the price of ivory and a huge escalation of elephant poaching, to the point where forest elephants are on the brink of extinction and elephant populations across large parts of Africa and Asia are at serious risk. In China, it is estimated that as much as 90 percent of the ivory currently on sale is derived from illegal sources. The criminal networks are in complete control of the trade. In short, legalizing the trade in rhino horn will play right into the hands of the organized criminal syndicates, and could accelerate the rhino's decline towards extinction. South Africa's authorities need to understand that that a trade proposal is the wrong way to go. It does not have the support of Asian rhino range states who indicated their wish to retain the trade ban in the Declaration from the First Asian Rhino Range States Meeting which took place in Indonesia on October 2013. Any proposal which might be put forward at the next CITES meeting, which will take place in South Africa in October 2016, is highly unlikely to succeed, which will be a huge public and political embarrassment for South Africa on home turf. The Born Free Foundation has submitted robust arguments to the Committee of Inquiry urging them to advise the South African authorities against pursuing a legal trade. The world's rhinos can't wait. We need to stop arguing about legalizing trade, and instead focus on what we all want: greater protection for rhinos through better enforcement and reduced demand. Only then will the world have a chance of reversing the alarming and horrific impacts of poaching on these ancient and majestic creatures.